I would like to begin this article by thanking the entity that made it possible: Permaculture Denmark. Thank you for providing us the necessary information, advice and connection to the Erasmus+ programme, through which we have been able to receive a grant to cover the costs of the nature-based design framework course. Thanks to Candela, promoter and participant of this enriching experience and to Catherine, bridge with Permaculture Denmark. 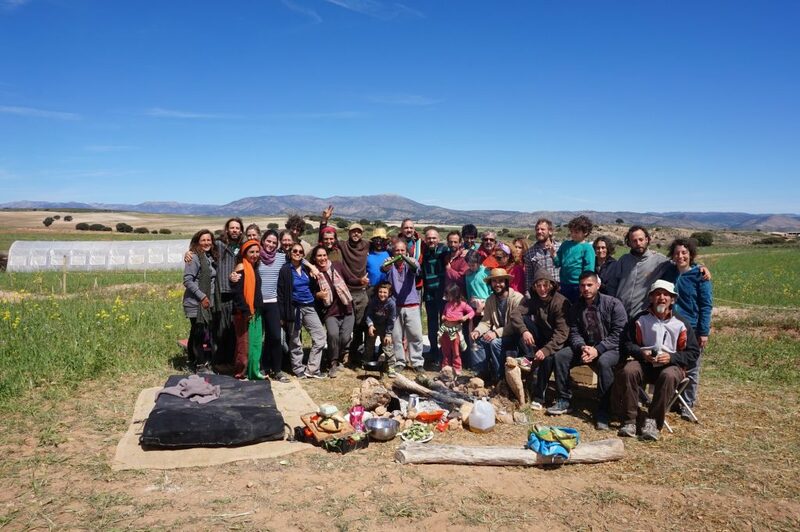 I would like this to be the first of several collaborations between the two networks, the Permaculture Denmark network and the Iberian Southeast Permaculture Network. But what am I talking about? Well, the course that took place from May 14th to 18th in Lisbon on natural design frameworks. At the end of the seasonal spring meeting at the Ecosystem Restoration Camp, Candela and I left for Lisbon. When we arrived we got immersed in the landscapes, the culture and the Portuguese university. It was in the facilities of the University of Lisbon, annexed to the botanical garden, where we received the course and a lot of learning. A design framework is a set of ethics, principles and practices that guide us when interacting with a medium. For example, when making a permaculture design on a land we would base our design on the 3 ethics, as well as on the 12 principles of permaculture. We can start by observing the land, understanding it and from there adapting it at the same time that we are modifying it to guide it towards a more sustainable state until we get to make it as permanent as possible. The 5 design frameworks that we focus in, in addition to other collaborative design tools such as “The WeLand”, were: biophilic design, biomimetic design, regenerative design, resilient design and permaculture design. For many people is the beginning of their learning about nature-based design. This design framework is based on the appreciation, recognition and the value of the natural world. Haven’t you ever been surprised by the height of a tree? Or the strength of a river? Or the flight of a bird? By remembering the link that unite us with the wildest and most natural world, by putting it into value, we are simultaneously recalling a very important part of our interior, the most instinctive and primitive part, the part that has existed for the longest time on earth and that has led us to what we are today as human beings. Being able to reconnect with the natural world opens the door to an ecosystem that has been developing in harmony for millions of years. It is through this door that the necessary inspiration begins to flow to recreate the beauty of the natural world on paper, in a garden, a house or an entire city. As we see many of the examples of biophilic design are based on introducing natural elements into urban and interior spaces such as trees and plants, scattered light sources imitating the leaves of trees or organic forms. The biomimetic design gives us the possibility to emulate natural technologies. From the connection with the natural world we can observe the forms, processes and ecosystems we are finding. Relying on nature as a mean of inspiration and learning gives us the clues to understand the mechanisms that govern this world. With these clues and through their abstraction, analysis and study it is possible to imitate nature. Copying nature provides us solutions to problems in a stable and adaptive way, solutions that have been successful for millions of years. Imitating the hexagonal shape of some corals to build strong, flexible and lightweight structures, or taking inspiration from burdock (a type of thistle) and its ability to attach itself to hair and invent velcro, or even understanding how peacocks’ feathers work by refracting light to give colors to fabrics avoiding decoloration, are just some examples of biomimicry. When we find damaged, degrading or collapsing ecosystems it is time to talk about regenerative design. Knowing what an environment was like to return it to its original state or to help it regenerate to a more optimal but different state is the key to regenerative design. Most of the problems that the current extractive production model is facing are the destruction of the ecosystem in which it operates and, with it, the loss or increase in the price of the resources that were being extracted. A clear example is the soil of intensive farming. When forests are cut down to establish intensive monocultures, a high level of profitability is achieved at the beginning, which diminishes as the soil wears down and contaminates to the point where it ceases to be fertile and becomes unprofitable over time. But if instead of fighting with the natural world we help it run its course, letting it do its job, we find that it has an immense capacity for regeneration, through many interconnected pathways that generate endless solutions. By adapting technology to the needs of the land it is possible to accompany nature in its process while obtaining the necessary resources to live in abundance. In this way, and using the information provided by degraded soil, we can rely on the power of nature instead of brute force to find multiple ways of regeneration. Nourishing the soil instead of feeding the crops may seem impractical at first glance, but the more nourished and healthy the soil is, the more fertile it becomes. In fertile soil, plants grow stronger, more resistant and bear more fruit, making it much more profitable in the long run to nourish the soil than to continue to degrade it with chemical fertilizers and poisons. This design framework focuses on flexible solutions capable of absorbing and resisting anomalies. A resilient design is able to adapt to adverse conditions to return to its original state once the problem is overcome. One of the keys to this design lies in having a great diversity capable of providing a multitude of different solutions to the same problem. Thus, even if some of the solutions fail, if we have a good diversity, it is much more likely that the solution to the problem will be found in another way. A clear example can be found in forests, where the connection between the roots of plants allows the exchange of nutrients, the more diversity of plants we find, the greater the diversity of nutrients will be available to the entire forest and even if one species disappears, if there is diversity many others will be able to continue their work and occupy their ecological niche. As a result the redundancy of elements in a system makes it much more resistant to change and therefore more sustainable. Up to this point we have practically defined many of the characteristics and principles of permaculture design thanks to the previous design frameworks. We can talk about design in permaculture when by connecting with nature and observing it, we can find ways to flow with it, regenerate it and make it more resilient until we reach a permanent ecosystem. To be able to understand culture as permeable, to observe it flow through generations and join its course is surely a good way of doing permaculture. In this way, permaculture design has a wide range of development pathways or petals that cover most areas where human beings develop, being a holistic design system. Natural agriculture, breeding, bio-construction, self-management, integral health, community management and appropriate technology are the most common petals or areas of permaculture. In this way, permaculture design is a holistic design framework, it has a wide range of development pathways or petals that cover most areas of human culture . Natural food growing systems, free education, bio-construction, self-management, integral health, community management and appropriate technology are the most common petals or areas of permaculture. By applying permaculture to a project, we can achieve better results with less effort. An example of permaculture applied in a farm would be to make fertilizers and compost with animal and vegetable scraps and with them feed the fields that in return will feed the animals, feed us and give us health, medicines and materials to create tools or build. As well as spaces where we can raise our children and live in community and also provide a surplus to trade and finish covering the needs of the farm. For me it has been very enriching to contact other permaculture networks such as the Danish and Portuguese ones. To understand that, even though we are far away, we are on the same path and dream. It makes me feel grateful and happy. By being able to investigate and explore other design frameworks based on nature, finding similarities and complements with permaculture, it has given me new tools that I am already sharing with good reception in the networks I am part of. I’m also starting to integrate them into my designs with favorable results and I hope that over time they will be successful. The language immersion has been an opportunity to learn specialized terms and grammar and at the same time has forced me to express myself in English, the basic language of the course, reminding me of the importance of this language in order to connect with international networks. Somehow I think I’m beginning to appreciate the English language a lot more than I did before. To conclude, I would like to tell you that Portugal is a very interesting, unique and mysterious country to which we do not usually give all the attention it deserves. 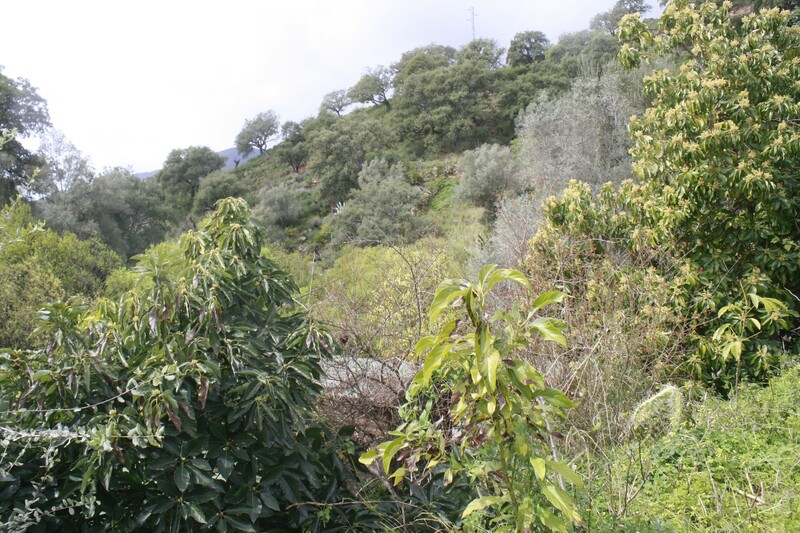 As many people is aware of, Permaculture in Portugal is growing strong. You might have heard of Tamera a really cool ecovillage with a system of lakes designed by Sepp Holzer. That one is the most famous one, but there is actually many more ecovillages and permaculture projects going on from North to South Portugal, and the interest in permaculture it is not only in the grass roots movement trying to live differently. Lisbon university is actually in the far edge of nature based solutions for climate change adaptation strategies. Hidden behind this kind of long names we find beautiful people working with permaculture and doing their best to introduce it into the academia. Gil and Hugo are two of them. They hold a week long course on “Natural Design Frameworks” for Phd students and any one else interested. The course took place in a big old building within Lisbon’s Botanical Garden. An absolutely magical place full of tropical plants, many of them, brought from Brazil. 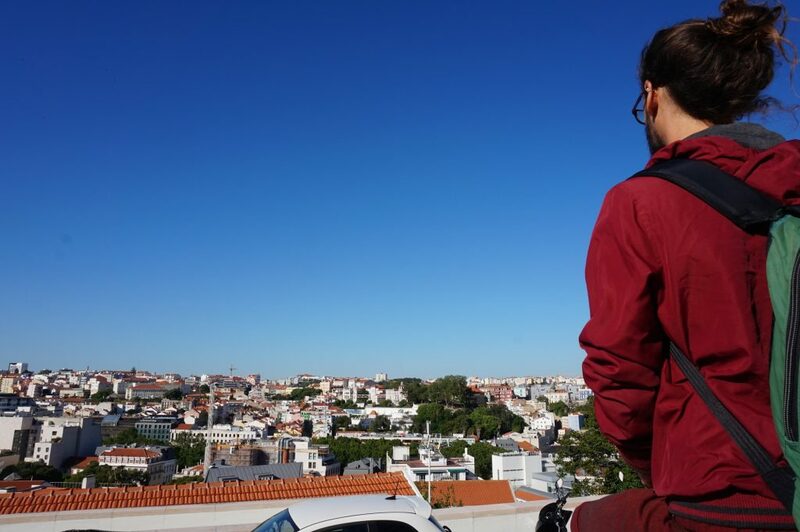 Me and my good friend Luis went to this course to enrich our knowledge on design and connect with the Portuguese network. In this articles we will explain some of the key insights we gained during the course. Some of the most relevant insights we learned were on the 5 nature based design frameworks. Biomimicry, Biophilic, Regenerative, Resilient and Permaculture design. Luis will deepen more on them. So I will focus on the ground base knowledge, the building blocks to understand how to do effective collaborative planning. So one of the initial and key concepts are comprehending “Integral Theory”. Integral theory is a revolutionary framework for understanding ourselves and the world we live in. It is based on a “medicine wheel” of four directions. In horizontal it goes from interior to exterior and in vertical from Individual to collective. Creating four quadrants that represent the four dimensions that can be describe as: “I”- everything inside you that makes you you, our on other words what you perceive, your experiences; “We” – your relationship with others, and your communication with them, it is the space for the cultures we are part of; “It” – your physical body and your behaviors; and “Its” – your membership and participation in the many systems in which your life is embedded. This simple diagram of Integral theory develops into very deep and profound argumentations and processes to ensure success and harmony within your personal life and the life of any project. This was put into practice in different ways, but the sublime one was on how we were guided for the final design challenge. In my opinion it was presented using a truly innovative collaborative design tool. The “WeLand”. It is a tool developed mainly by Hugo Oliveira with the Orla Design Project for collaborative design of sustainable communities and projects in real life scenarios. The idea is to use an essential pattern of life “The Torus” to guide the group of designers and stakeholders together through the design process. Anyhow, we were doing just a one day design exercise so to balance the participants and the interest of study that we had we divided in two groups, each working with an specific design project. The two chosen ones where on “Preventing Fires Risk through Conservation and Agroforestry Practices” guided by a couple of Phd students working on that issues. The other one was on “Designing a Local Economy for the region of Vale de Lama” to be implemented by the key holder of the topic on that local community. Vale de Lama is a Portuguese ecovillage, but the local currency intends to work on the hole region. I found “The WeLand” fascinating, because in a game like easygoing style, the group goes through different phases to ensure a truly collaborative design process. Moving through the form of a torus that has no beginning or end, and represents a dynamic process of communication within the stakeholder groups, the landscape and time showing processes of expansion and contraction; exploration, creativity, design and decision taking. In the original version there is clusters of cards and which tools to use in each phase can be selected from the bulk by what feels appropriate at the moment. For the sake of the exercise, Hugo made a list of printed guided questions from the ones the person of the group with the highest dice score will choose. The reflections of how a community process could be where also present on the dices. Everyone will throw a dice, the dice will the lowest score will define the speed of the group, and the person with the highest score will choose the question to answer. As we say the form of a torus is a never ending flow, but of course for us it has to start somewhere, so the first phase is represented starting in the broadest diameter of the Torus and moving towards the bottom vortex. In the very starting point we found “The Seed”. So we could define the context of our inquiry. The flow started with the process of “What we are” for landscape integrity inquiry. So we could define our ecosystem, the natural patterns present in it and the symbolic meaning it has for us. After moving through some of this questions, going deep into the vortex we get to “Who We are” This brings community engagement, as we empathize with the backgrounds and experience of the group, the participants assets, cultural stories, traditions or tendencies in the ecosystem. Then we enter the center of the torus, in this phase we had to define what we wish to become. Create a clear identity, vision, guiding principles, or anything else that shapes the direction of the group. After this we go out of the center by spiraling up through a parallel vortex to the one that brought us there. Here we identify the processes for how to become what we already know we want to be. 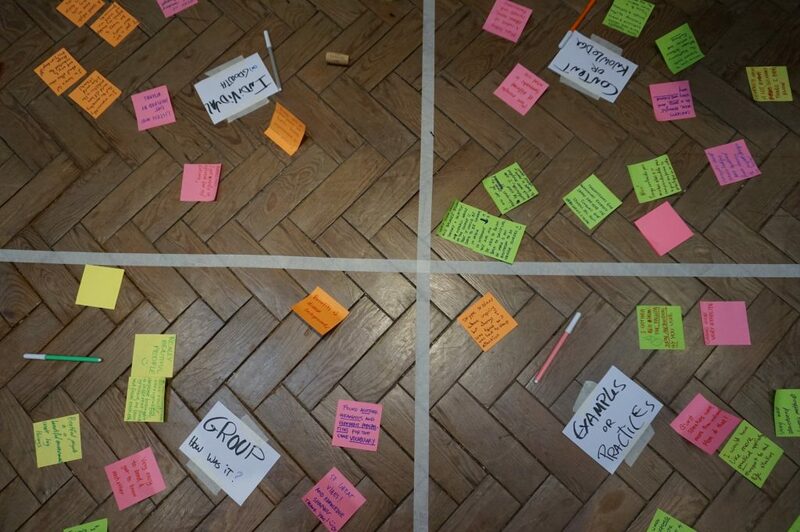 So here we explore how to create community engagement and how to ensure co-design processes and express them in practice. As well as creating a clear timeline for the project. Best through backcasting processes, were we first think of the last thing we will be doing before completion and going backwards from there. The last part was the Becoming. Represented graphically in our torus by the top part of the sphere expanding from the vortex. Here is the most practical part of implement the plan, monitor the impact of your project and always think about what could be done differently to ensure that through the process we are creating truly regenerative livelihoods. Represents the timescale of action for the different targeted issues while shaping a valley and the water retention figures that will be introduce in it. Super artistic! At the end of the “WeLand design game” we reached a tree. That invited the whole group to make a presentation our projects. Considering the short time we had for designing, approximately 8 hour work, I can ensure that this are very useful tools because the originality and depth of the designs was astonishing. Gil and Hugo gave very positive feedback to both groups and all members especially the core members got lots of good ideas and inspiration for getting out in the field and making the projects a reality. For the local economy group the next step is to use the “WeLand” with the other real stakeholders to design the local currency together. The Local Economy group making their presentation. They also used my Values web tool in their project! For me this course has been an eye opening to the power of “gamizing” the collaborative design processes. It really helps people get engaged, find it fun to design and to not forget to go through any of the essential steps to take in consideration for a holistic and collaborative design. The Nordic Permaculture Movement is creating cohesion and consistency through Scandinavia! associations together with many other engaged permaculturist gathered to figure out how to support each other and the permaculture movement in Scandinavia. This year the gathering took place in the beautiful eco-village Friland in Djursland. We got the chance to share a yearly evaluation on the state of the Norwegian, Danish and Swedish permaculture associations. That process helped us all to evaluate on the different strategies we are following and see which ones works best. It is clear that to connect through local networks is key as well as to keep a solid core team to make sure that the association is running smooth. A couple of session where focusing on the LAND network. As it is expanding and reaching to the other Nordic countries apart from Denmark. The idea was to gather the collective wisdom and to strengthen the network. All the important information and the minutes of the meetings will be uploaded soon. We also had the honour to assist to Tyco’s and Karoline’s diploma project presentations. The process sparked heated discussions about the diploma process. This were dealt during the Nordic council meetings and many good decisions came forward. For example: with the aim to speed up the design of the Nordic diploma, a new group has been formed, It has been called the Nordic Permaculture Secretary. It consist of one member from each of the Nordic Permaculture Associations and one Diploma holder from each country. This group will refined the agreed text and make a strategic plan to discuss during the year the major conflicting points in the text. As for example what is expected of a diploma aspirant and how should the project be presented. One of the most fruitful session, in my opinion, was on planning fund-raising activities for the research group as many new ideas on how to get funding came forward and some participants committed to work further with developing a big collaboration strategy to apply Scandinavian and European funds. During the Nordic Permaculture Institute meetings some people was more interested in depending on permaculture topics rather that attending the formal association decisions. So they were able to have an alternative. Anyhow the group remarked that this forum is the only time in the year where the two associations are sharing a decision taking space. Therefore it is important to give priority to that formal association gathering for knowledge and skills sharing we hold the Nordic Permaculture Festival every summer. Among the alternatives there was a guided tour around Friland were Tove explained all the intricacies of the living community and the design of the passive constructions. They were so inspired by the beautiful natural buildings and their people. Tyko showed the new piece of land where him and Karoline are planting chestnuts among other trees and bushes in a medium scale agroforestry system. Niels Corfield from UK hold an inspiring session on advanced design. Looking specifically at how to tackle major challenges in your permaculture project. Some participants seem to have a break through on how to handle the permaculture projects the are creating. The next Nordic Permaculture gathering will take place in Lund, Sweden the from the 9th till the 11th of February 2018. So write it already in your calendar! We also had the honour to assist to Tycho’s and Karoline’s diploma project presentations. The process sparked heated discussions about the diploma process. This were dealt during the Nordic council meetings and many good decisions came forward. Tycho showed the new piece of land where him and Karoline are planting chestnuts among other trees and bushes in a medium scale agroforestry system. Permaculture Denmark as an educational institution has being applying the last 2 years for Erasmus + funding to send permaculture teachers out around Europe to be educated and bring exciting new knowledge back home. Many of the applicants were accepted thanks to Cathrine Dolleris that did a very good job applying for us. I have been very lucky to receive an Erasmus + for doing a 2 months internship in England for researching forest gardens. Once in a while I will tell about the most interesting stops in during trip. The first stop in my tour was the International Permaculture Convergence. There around 700 permaculturist gathered to share and learn about the newest knowledge and projects in all sort of topics. Of course following my interest I focused on connecting with forest garden topics. Among others Tomas Remiarz baseline survey project (1); Jerome Osentowski Central Rocky Mountain Permaculture Institute (2) or Sagara Swier presenting East Devon Forest Garden (3). Read more about the forest garden projects here. The plenum sessions were also very inspiring. Pandora Thomas made the crowd feel as the black church explaining in a interactive manner about the Black Permaculture Network (4), where they teach permaculture to black people that have been in jail and now totally transform their lives. Rob Hopkins motivated us all to keep on moving forward ste p by step, by showing the steady progress of the transition movement he initiated (5). Finally Rosemary Monrrow touched our tender side transforming grief to permaculture action in a theatrical way with some of her closest students. One of the most special moments for me during the Conference was when I met the lovely activist from Aranya agricultural alternatives (6). Padma Koppula, Narsanna koppula and their team. They got very excited to get to know me when they understood that I was part of Permaculture Denmark. They were really thankful for the big economic help that Permaculture Denmark has given for their project to thrive. There we could see that they have done plenty of work and more to come as the next International Permaculture Conference will happen in 2017 in India with the Aranya pro ject as main organizer. When receiving the responsability stone for the IPC Narsanna koppula said that it is important to be mentally prepared for going to India but that it is very worth it. I wish them the best and I encourage you to start planning for the Asian tour. It is worth it. The Permaculture Convergence that started 2 days afterwards was a week of coming back to family. All participants were giving the best of them to make the event unforgivable, sharing their knowledge, skills and love.The workshops and projects presented were impressive but the most commonly mentioned best thing was the fact of connecting with beautiful people from all over the world, making new friends that share our same dreams and inspire each other with their examples to keep on and move forward building the future we want to see in the world. For et års tid siden blev jeg spurgt af Cathrine Dolleris om jeg ville tage et permakultur design certifikat (PDC ) med støtte fra den europæiske fond “Erasmus +” . Jeg har længe tænkt over at tage et certifikat kursus, men det er jo ikke gratis. Så da lejligheden kom sagde jeg naturligvis ja. Det skal siges at i denne omgang fik Jeg både støtte til selve rejsen, da det var over 500 km væk op til 70 euro i støtte per dag dog i max 10 dage. Kurset jeg var på varede i 12 dage og så jeg fik næsten hele kurset støttet inklusiv overnatning. Jeg rejste til island efter kurset og fik så ikke støtte til den del af rejsen for Erasmus + dækker kun ud og hjemrejse man skal altså rejse direkte hjem igen. Det havde jeg så ikke helt forstået. Men nu ved du det hvis du skal med Erasmus +. Men det var i hvert fald ikke et stort arbejde at skrive selve ansøgningen for mig da Cathrine Dolleris jo havde været så sød at gøre alt benarbejdet, altså skrive den store ansøgning til Erasmus + fonden. Jeg tror jeg skrev den på et par timer. Det skal lige siges at jeg måske smurte lidt tykt på nogen steder om hvordan det skulle styrke mine kompetencer osv. Men jeg må indrømme at jeg faktisk føler at jeg kan stå inde for det idag på den anden side, sjovt nok jeg troede faktisk ikke at det ville være så banebrydende jeg havde jo hørt mange af tingene før tænkte jeg. Men et kursus sætter det simpelthen sammen på en anden måde og det er også for fedt at være sammen med en flok “permanørder” i næsten 2 uger..
forresten kræves det også af “Erasmus +” at man går ud bagefter og deler sin ny erfarede viden med andre. Det kan nok gøres på mange måder håber jeg men det ville være oplagt at lave workshops eller lign. Det fik jeg allerede lidt lejlighed til at gøre på Island her i sommers. Men om selve kurset. Stedet “Carraig Dulra” ligger en times kørsel syd for Dublin ude i midten af ingenting. Meget smukt sted med masser af skov tæt på og store bakker. Kursus holderne var meget afslappede og der var en god stemning ingen stress. Alting var semi selv organiseret man kom på et madhold. Hvilket resulterede i at man nogle gange gik lidt glip af undervisningen med mindre man hakkede grøntsager inde i klasselokalet som vi så gjorde nogle gange. Men der var virkelig en god stemning og de få personlige problemer vi havde fik vi løst. Der var også en gennemtrængende ærlighed i hele forløbet man havde en følelse af at lærene gjorde det for vores skyld. Vi havde en workshop holder som havde været højt at flyve inden for business verdenen som nu byggede øko huse, og jeg husker stadig da han fortalte sin livs historie en af aftenerne og sagde i klassen at det vigtigste ved sådanne her kurser er ikke kun den viden man får af at være her men endnu mere det at få tændt ilden inde i sig og mærke magien, føle fællesskabet se visionen for sig inde i en selv. Det var i hvert fald det jeg hørte ham sige. Det gjorde et stort indtryk på mig for på mange måde var det lige præsis det jeg fik ud af det, når jeg ser tilbage på det. Jeg kan ikke huske alle de planter der blev talt om og deres egenskaber men så er det godt jeg kan gå hjem og slå dem op og e mere på teknikkerne i the “Earth care manual” . Men jeg fik lysten til at kigge endnu mere ind i permakulturens verden. Nu føler jeg det er noget jeg gør jeg er permakulturist. Jeg er nu en del af sekten 😉 Og jeg kan varmt anbefale Carraig dulra til andre som tænker på at tager udenlands med Erasmus +.